"The united front work targeted on the areas of science and technology of the United States is an important measure of our party to deeply divide western hostile forces, to maintain social stability, to ensure national security, to comprehensively advance the rapid development of our own science and technology and economy, to accelerate the construction of national defense modernization, and to consolidate the overseas united front," the document states. Chinese supreme leader Xi Jinping greatly increased the use of united front work as a key tool in China's global influence operations. 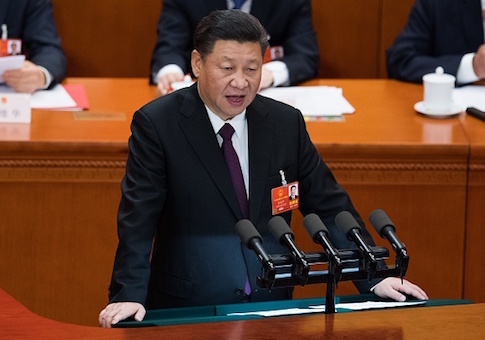 Xi stated in a September 2014 speech that united front work is among the Party's "magic weapons" in low-level global warfare against enemies, including the United States. The document is dated Dec. 13, 2016, and carries the red hammer and sickle seal of the Party's general office, the administrative unit located within the leadership compound in Beijing known as Zhongnanhai. Copies were sent to the National People's Congress, State Council—two Chinese government arms—and Central Military Commission, the Party organ that controls the military. "In our experience, there is no nation that targets America's assets more aggressively than the Chinese government," Wray told NBC News. "And the Chinese government works hand in hand with Chinese companies, among others, to do everything they can through all sorts of means to try and steal our trade secrets, our economic assets," he added. The threat posed by aggressive Chinese theft of trade and economic information is having "a real impact" on American jobs, businesses, and consumers, he said. The USTR report states that China has adopted a plan for obtaining foreign high technology between 2006 and 2020, and then "re-innovating" the know-how for Chinese use. China's illicit information and technology theft costs Americans $225 billion to $600 billion annually in lost information, the USTR report said. The covert technology collection program is intended to bolster China's large-scale conventional and nuclear military buildup and expand support for pro-communist forces outside China. The Communist Party report states that the United States remains the world's technology leader and has blocked China from gaining access to advanced American know-how. "Though the United States has been the bellwether of high and new science and technology of today's world, for a long time it has consistently resisted and been hostile toward our country that has successfully practiced the socialist system with Chinese characteristics out of consideration for maintaining its own national interests and ideology," the report says. "Even in today's fair competition in the world, [the U.S.] still stubbornly imposes a blockage on high and new and core science and technology, control over our recruitment of key talent, and an embargo of related equipment against our country, having an extremely negative impact on our country in the areas such as export trade and construction of military modernization, etc." The Central Committee's general office is the powerful organ in charge of administrative affairs and drafts and circulates all directives for activities. "Your department must take the lead in further strengthening reasonable investment of various resources, effectively join forces with diplomatic, state security, and military intelligence agencies to deeply explore and develop personal relationships and connections related to the areas of high and new and core science and technology of the United States," the document states. "We should particularly target those key persons who have a relationship of commercial interests with our country (including Hong Kong and Macau special administrative regions) and overseas institutions of large corporations of our country and directly participate the research and development in the related areas of science and technology, or have special and close relationships with them," the report said. The United Front Work Department was urged to enthusiastically "carry out the superb tradition of our Party of ‘concentrating our forces to deal with the big thing,'"—a high priority for the regime. The report calls for a targeted program of gathering intelligence on all aspects of the lives of Americans engaged in high-technology work, including "intimate friends" and family members as part of the technology acquisition program. "Through systematic, reasonable, effective, and careful checking and investigation covering political, financial, cultural background, and life hobbies, etc. aspects of the related key persons and their immediate family members or intimate friends we shall make targeted, active and initiative offensives of united front work to try our best to provide various preferred measures such as preferred industrial, commercial, and financial policies, special benefits, and huge funding support, etc. for their work, life, study, and career development," the report says. "And to try our best to gradually make them become the matured objects of the united front work of our Party and to directly or indirectly serve and work for our Party, government, and the socialist system with Chinese characteristics." The report urged the United Front Work Department to "sincerely and carefully organize the implementation of the Request for Instructions according to the spirit of this notice and reasonably and effectively arrange the deployment of various related personnel and resources, and make the implementation of this working plan an item to be evaluated in the annual performance evaluation of your department. No agency or individual shall make any change at will. Our office will regularly conduct supervision and checking on the implementation of Request for Instruction." "China's united front approach has always used civil actors to promote political ends," Brady stated in a recent report on China's influence operations. "[Chinese Community Party] united front officials and their agents are tasked with developing relationships with foreign and overseas Chinese personages to influence, subvert, and if necessary, bypass the policies of their governments and promote the interests of the CCP globally," she added. Secret Party reports were leaked to U.S. professors in 2000 outlining an internal debate among Communist Party leaders over how to handle pro-democracy protests in Beijing's Tiananmen Square in 1989. The regime brutally suppressed the demonstrations, sending in tanks and armored vehicles and killing hundreds and possibly thousands of unarmed Chinese protesters.